Large access doors make clean-up and maintenance quick and easy. Safety limit switches are fitted to each access door to prevent accidental mixer startup while open. Module unit with holding hopper for one batch of aggregates and cement weigher. Planetary countercurrent mixing technology – for a homogenous mix within the shortest possible time. The rotating mixing stars rotate around the center vertical axis of the mixer, delivering intense countercurrent mixing action – transferring all mixing energy directly into the concrete. This modern mixing technology also ensures a complete homogenous mix in the shortest possible time, Also, critical mix designs will have a superior quality. The top mounted motor and drive technology offer an unobstructed mixing pan interior for faster mixing and fast / easy cleaning. Several water spray jets with non-return valves add water quickly and uniformly to the mixer. Additionally, the spray jets perform a cleaning function. 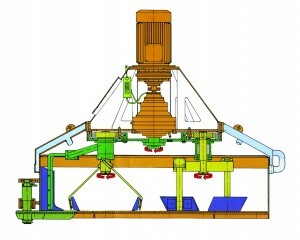 For complete cleaning of the mixer trough, high-pressure cleaning devices can be installed. 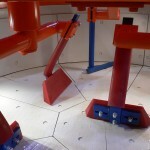 For exact water metering a microwave probe can be installed in the pan floor or wall. Oversized discharge gates, hydraulically operated, assure a short discharge time. 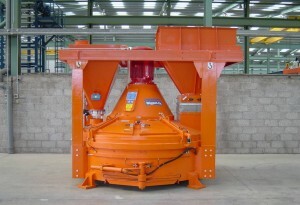 The mixer can be ordered with up to four discharge gates. A hydraulic hand pump is available for opening of the discharge gate in case of power failure. The planetary countercurrent mixing technique minimizes wear. Mixing arms are fabricated of spring steel, the mixing pan floor and wall are lined with special wear-resistant, replaceable wear plates (upon request: chilled cast tiles or armor-plated mixing lining plates) for long service life and low operating costs. All limit switches, solenoid valves and the hydraulic system motor are conveniently wired to a junction box. 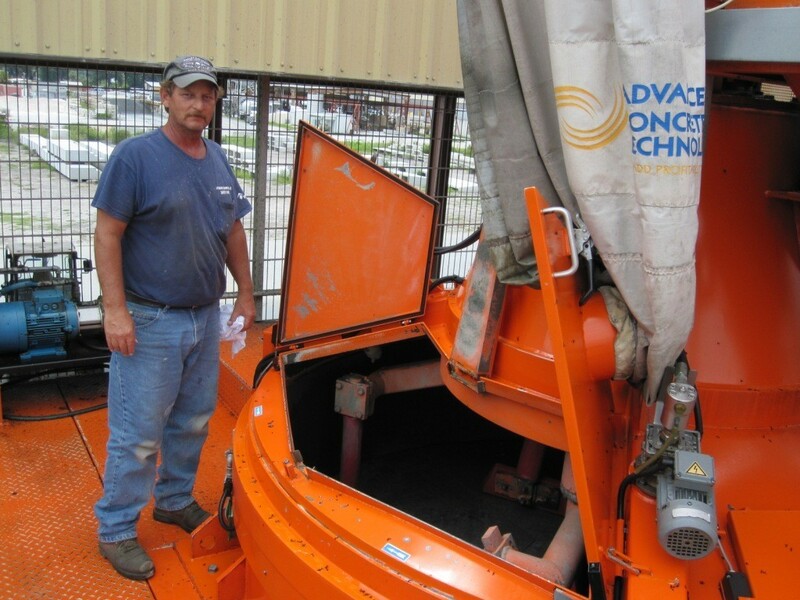 The unobstructed mixing pan is fully utilized for high intensity mixing action resulting in superior concrete. The unobstructed design als makes it easy for cleanup. High-quality mixing shovels, mixing arms and wear liners ensure a long service life and low operating costs. 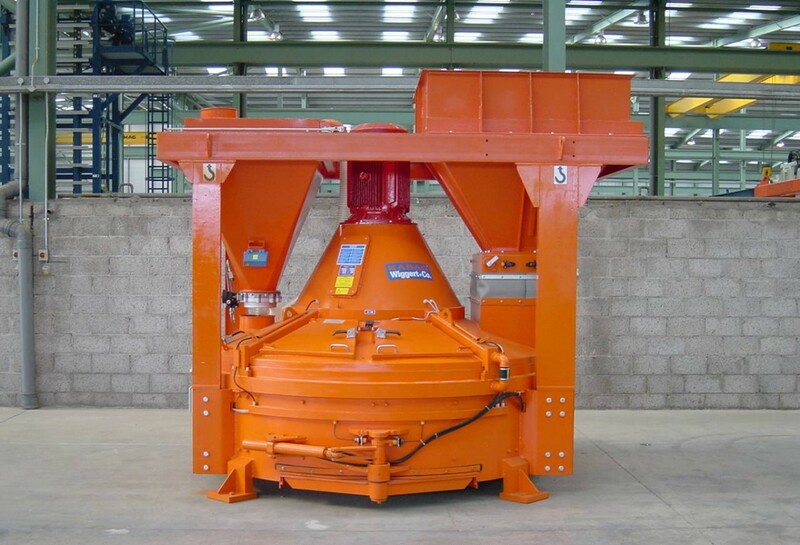 A powerful motor with robust gear reduction is mounted above the mixing pan and turns the rotor with side scraper shovels. The mixing stars are mounted off-center on the rotor. The star axis rotates as it travels around the stationary planetary gear. Depending on the mixer size, 1, 2 or 3 mixing stars are available. For the HPGM 1125 model and larger, a hydraulic torque converter is included as standard equipment, allowing smooth emergency startup with a full mixer. 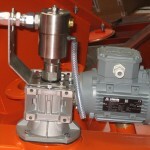 Additionally, it serves as overload protection for the motor and the gear reduction. The drive system is completely sealed against dust contamination and is easily accessible.